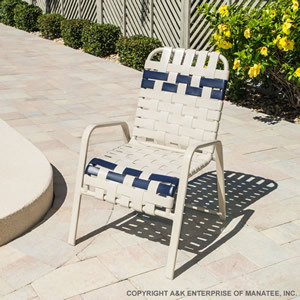 The R50B Flat Arm Cross Strap Chair is a commercial-grade patio chair that has a sandblasted and powder-coated frame crafted from extruded aluminum tubing. The 2 inch wide vinyl strapping is double-wrapped and available in a wide variety of colors. The cross strap design provides added support and can be customized in any color and pattern imaginable.